This article is about the line of devices. For the first-generation device marketed with this name, see iPad Mini (1st generation). Not to be confused with iPod Mini. On October 16, 2012, Apple announced plans for a media event on October 23 at the California Theatre in San Jose, California. The company did not give the subject of the event, but it was widely expected to be the iPad Mini. At the event, Apple CEO Tim Cook introduced a new version of MacBook family and new generations of the MacBook Pro, Mac Mini, and the iMac, then unveiled the fourth-generation iPad and the iPad Mini. The iPad Mini comes with several pre-installed applications, including Siri, Safari, Mail, Photos, Video, Music, iTunes, App Store, Maps, Notes, Calendar, Game Center, Photo Booth, and Contacts. Like all iOS devices, the iPad can sync content and other data with a Mac or PC using iTunes and to Apple's iCloud online service. Although the tablet is not designed to make telephone calls over a cellular network, users can use a headset or the built-in speaker and microphone and place phone calls over Wi-Fi or cellular using a VoIP application, such as Skype. iPads offer dictation when connected to a Wi-Fi or cellular network. Applications from Apple and third-party developers can be downloaded through the App Store, an application distribution market for iOS that is maintained and regulated by Apple. The service allows users to browse and purchase applications. Optional apps from Apple that can be purchased through the App Store include GarageBand, iMovie, iPhoto, and the iWork apps (Pages, Keynote, and Numbers) are available. The device has an optional iBooks application, which displays books and other ePub-format content downloaded from the iBookstore. Several major book publishers including Penguin Books, HarperCollins, Simon & Schuster and Macmillan have committed to publishing books for the device. Despite the iPad being a direct competitor to both the Amazon Kindle and Barnes & Noble Nook, both Amazon.com and Barnes & Noble offer e-reader apps for the iPad. On June 8, 2015, it was announced at the WWDC that all four generations of the iPad Mini would support iOS 9. However, certain new multitasking features, such as Slide Over and Picture in Picture, will be limited to the second, third generation, and the fourth generation. Split View, another new multitasking feature, is only available on the iPad Mini 4. The current version of iOS, iOS 12, is supported on iPad Mini 2 and up. The upgrade to this version is available as a free download. The first generation iPad Mini shipped with iOS 6.0 and the highest supported version is iOS 9.3.5. 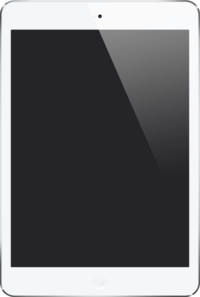 There are four buttons and one switch on the iPad Mini, including a "home" button near the display that returns the user to the home screen, and three aluminum buttons on the right side and top: wake/sleep and volume up and volume down, plus a software-controlled switch whose function varies with software updates. The tablet is manufactured either with or without the capability to communicate over a cellular network. All models can connect to a wireless LAN via Wi-Fi. The iPad Mini is available with 16, 32, 64 and 128 GB of internal flash memory, with no expansion option. Apple sells a "camera connection kit" with an SD card reader, but it can only be used to transfer photos and videos. The first generation iPad Mini features partially the same hardware as the iPad 2. Both screens have resolutions of 1024x768, but the iPad Mini has a smaller screen and thus higher pixel density than iPad 2 (163 PPI vs. 132 PPI). Unlike the iPad 2, it has 5 MP and 1.2 MP cameras and the Lightning connector. The system-on-chip is A5, which is the same one found in the later revision of the iPad 2 (32 nm). The audio processor is the same found in iPhone 5 and iPad 4th generation, which allows the iPad Mini to have Siri and voice dictation unlike the iPad 2. The graphics processor (GPU) of the first generation iPad Mini is the same one found in the iPad 2 (PowerVR SGX543MP2). iPads with a data connection can download data through cellphone networks, but can not make voice calls. They can act as a hotspot, sharing the Internet connection over Wi-Fi, Bluetooth, or USB. The Smart Cover, introduced with the iPad 2, is a screen protector that magnetically attaches to the face of the iPad. A smaller version is now available for iPad Mini. The cover has three folds, which allow it to convert into a stand, held together by magnets. Smart Covers have a microfiber bottom that cleans the front of the iPad, and wakes up the unit when the cover is removed. It comes in six colors of polyurethane. Apple offers other accessories, including a Bluetooth keyboard, several types of earbuds or headphones and many adapters for the Lightning connector. AppleCare and free engraving are also available for the iPad Mini. The most recent model is the iPad Mini (2019). The iPad mini models are listed in a comparison grid. Reviews of the first generation iPad Mini have been positive, with reviewers praising the device's size, design, and availability of applications, while criticizing its use of a proprietary power connector and its lack of expandable storage and Retina Display for the first generation iPad Mini. The device competes with tablets such as the Amazon Kindle Fire HD, Google Nexus 7, and Barnes & Noble Nook HD. Joshua Topolsky of The Verge praised the industrial design of the iPad Mini, however panned its lack of Retina Display and price. The iPad Mini 2 was well received, praising the Retina Display and Apple A7 chip performance, with criticisms on the price increase and the quality of the camera. ^ Lai, Richard (September 17, 2012). "Pegatron reportedly nabs 50 to 60 percent of iPad mini orders, breaks up Foxconn's monopoly". Engadget. AOL. Retrieved November 11, 2012. ^ "Apple iPad mini will be Available on November 2". Gadgetian. October 23, 2012. Retrieved October 23, 2012. ^ "iPad Mini Release Date Is November 2nd (For Wi-Fi Models)". WebProNews. October 24, 2012. Retrieved October 24, 2012. ^ a b c "Apple – iPad - Compare iPad models". Apple. October 24, 2012. Retrieved October 24, 2012. ^ "Apple iPad Mini Available for Pre-order in Thailand". November 3, 2012. Retrieved November 3, 2012. ^ ChrisWelch. "Apple introduces iPad mini 3 with Touch ID, but an old processor". The Verge. Vox Media. ^ "iPad mini launch: Apple's sends invitations for iPad mini unveiling". BGR. October 16, 2012. Retrieved October 24, 2012. ^ Lowensohn, Josh (October 16, 2012). "iPad Mini, anyone? Apple sets Oct. 23 event | Apple - CNET News". Cnet.com. Retrieved October 24, 2012. ^ Myslewski, Rik (October 16, 2012). "It's official: Apple will reveal 'a little more' on October 23". The Register. Retrieved August 17, 2015. ^ Chang, Andrea (October 22, 2012). "Apple debuts iPad mini tablet". Los Angeles Times. Retrieved October 24, 2012. ^ Sarno, David (January 29, 2010). "Apple confirms 3G VoIP apps on iPad, iPhone, iPod touch; Skype is waiting". LA Times. Retrieved March 31, 2012. ^ a b "The new iPad: It's a Breakthrough because it features are". Apple. March 7, 2012. Retrieved March 11, 2012. ^ Ankan Deka, Jim (September 14, 2011). "iPad – the Musician's Genie". EF News International. Eastern Fare Music Foundation. Archived from the original on October 30, 2011. Retrieved March 31, 2012. ^ Patel, Nilay (January 27, 2010). "The Apple iPad: starting at $499". Engadget. AOL. Retrieved April 20, 2012. ^ Topolsky, Joshua (January 27, 2010). "Live from the Apple 'latest creation' event". Engadget. AOL. Retrieved February 4, 2010. ^ "Apple tablet due March, to get Kindle-killer book deal?". Electronista. MacNN. December 9, 2009. Retrieved April 20, 2012. ^ "Free Kindle Reading Apps". Amazon.com. Retrieved April 20, 2012. ^ "Free Nook app for iPad, Download eReader app – Barnes & Noble". Barnes & Noble. Retrieved April 20, 2012. ^ "Apple – iOS 9". Apple Inc.
^ Eran, Daniel (November 8, 2012). "iPad mini LTE models set to ship in five days". AppleInsider. Retrieved November 8, 2012. ^ "16 Reasons for the Apple iPhone 5 64GB". Versusio. Retrieved February 7, 2013. ^ "iPad 2 Smart Cover Teardown". iFixit. Retrieved April 16, 2012. ^ "Apple – Smart Cover". Apple. March 2, 2011. Retrieved April 16, 2012. ^ Wright, Josh (October 24, 2011). "iPad 2 Smart Cover colors revised". Macgasm. Retrieved March 30, 2012. ^ "AppleCare for iPad". Apple. Retrieved June 4, 2014. ^ "Engraving and Giftwrap". Apple. Retrieved June 4, 2014. ^ "All-new iPad Air and iPad mini deliver dramatic power and capability". Apple Newsroom. Apple. Retrieved March 18, 2019. ^ "iPad mini Environmental Report" (PDF). Apple and the Environment. Apple Inc. October 2013. Retrieved March 27, 2016. ^ "iPad mini 2 Environmental Report" (PDF). Apple and the Environment. Apple Inc. September 2015. Retrieved March 27, 2016. ^ "iPad mini 3 Environmental Report" (PDF). Apple and the Environment. Apple Inc. October 2014. Archived from the original (PDF) on April 11, 2016. Retrieved March 27, 2016. ^ "iPad mini 4 Environmental Report" (PDF). Apple and the Environment. Apple Inc. September 2015. Retrieved March 27, 2016. ^ "iPad Mini Environmental Report" (PDF). Apple. March 18, 2019. Retrieved March 29, 2019. ^ "iPad mini review". gdgt. May 13, 2013. Retrieved May 13, 2013. ^ a b "iPad mini review". Engadget. AOL. October 30, 2012. Retrieved May 13, 2013. ^ "iPad mini review". The Guardian. October 31, 2012. Retrieved May 13, 2013. ^ "Apple iPad mini review". BGR. November 6, 2012. Retrieved May 13, 2013. ^ "With The New iPad, Apple Accelerates; With The iPad Mini, It's Pedal To The Metal". TechCrunch. October 30, 2012. Retrieved May 13, 2013. ^ a b Topolsky, Joshua (October 30, 2012). "iPad mini review". The Verge. Vox Media. Retrieved May 13, 2013. ^ a b "iPad Mini review: More than just a smaller face". CNN. November 6, 2012. Retrieved November 6, 2012. ^ "iPad mini - review". The Guardian. October 31, 2012. Retrieved November 6, 2012. ^ "iPad Mini: Everything You Need to Know". Gizmodo. October 23, 2012. Retrieved November 6, 2012. This page was last edited on 1 April 2019, at 00:57 (UTC).